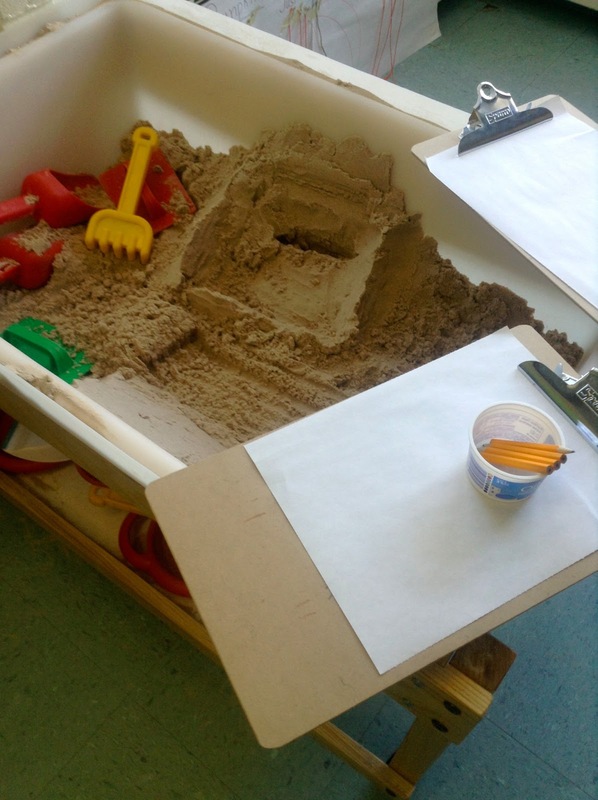 I have been thinking a lot lately about sand play (fyi: sand and blocks are two areas that I think about often). In this current educational climate of, "if you aren't doing literacy activities then you'd better be doing math activities, and they'd better be real activities that are quantifiable...", I think about the play based learning that is becoming endangered in our kindergarten classrooms. I often hear the phrase, "purposeful play." Now, I know that all play is purposeful, but what they really means is, "Sure they can 'play' but it better be play that is based solely on the prescribed outcomes..." So I have been thinking of a way to promote play and creativity, while still placating those "purposeful play" mentalities. 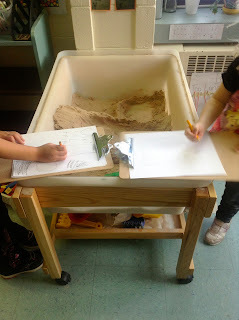 What we have been practicing with our sand play (and block play) is a kind of a "build it, draw it, write about it" philosophy. After we build it, we sketch it, then we write about it. Not too complicated, but the results are what I am most impressed with. Instead of trying to come up with something new each day to write about in our writing journals, we are writing about a variety of subjects throughout the day. Instead of having a set time for writing (which we still do at times), we are finding that our incidental writing is more authentic. It is another step in making sure my curriculum is integrated. We don't just have to do writing at writing time. Writing happens in all kinds of ways throughout the day. And, most importantly, I am finding when we are writing about our creations, we are writing more. Instead of short sentences, we are beginning to write stories. We are not writing to get it out of the way, but really putting in time to make sure we get it just right. I am impressed with our effort and our output. I sometimes get caught up in the idea that if I am doing this, then surely everyone else must be doing this as well, surely I am not that original. But as I reflect upon my practice and my beliefs about education in the kindergarten classroom, I become more convinced that we have to demonstrate in our practice why we believe activities such as sand play and block play are so important. This is just one of those ways. What a wonderful post! 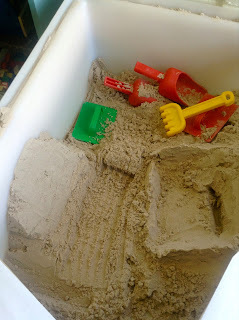 I had a huge sandbox for my kids when they were little and we spent hours out there. Our favorite activity was digging channels and then adding the hose in to make rivers and lakes. I have a huge block collection and teach a blockbuilding class in the homeschool program that I work in. I also bring blocks to my art studio classes. I do have kids sketch and sometimes take dictation. We always have an oral sharing period at the end of class and I take photos to document creations. Your idea of consistently sketching and writing is so obvious, and such a meaningful way for the students to grow in the area of communication skills. Thankyou! I have done a similar thing with a stuffed sock animal class that I teach. We have a journal and first students draw what they think they'd like to sew. Then after the animal is finished they write a description of it. Then they build a house with boxes, construction paper, colored masking tape, fabric, etc.... and write a description of that. Then we play with our sockpets, have tea parties, visit each other's houses. After students write about our class events or make up stories about their sockpets. Along the way I take a lot of photos showing the progress in the sewing and building as well as the tea parties! I had a lot of parent help, but the students really had a lot of input and choice. Towards the end of the semester students were choosing to write, or build additional accessories like cars and tents, or even sewing more sockpets. They took complete ownership of their learning and were inspired by each other's creations too! Thank you so much! I love what other activities you have been doing with children. I think, for all of us, when we have choice and can claim ownership over what we are doing, that is when true learning happens. Thanks for your insight! Build, Draw, Write makes so much sense. In our forty minute art classes I do something similar, especially with our "architecture block" center. I don't have sand in the art classroom. Like Frances, I spent hours in the sandbox with my son. Some of the "best" private pre-K programs in Portland (ME) have huge indoor sand play areas. I would love to see this extend to kindergarten. All teachers need to respect play as the source of learning. Kudos for your fine work! Thanks! We're luckily in PEI in that our kindergarten's are play based. I can see that eroding away unless we are diligent. This is just part of it. Teachers also need to realize we can encourage literacy and numeracy through play, and we need to be vocal about it. sometimes I'm sure clip boards are the most valuable tool I use in the K classroom. I am ecstatic when a child goes to get clipboard, paper and pencil to write or draw about what's going on in the classroom. Yes, the key for me was making sure I had/have clip boards available everywhere. Also, that the children know how to use them- and that they can use them! Once all of that was in place, the writing became a natural outcome. What a great post! I think it's also difficult for teachers to do something with their students where they are not "making something" and then it turns into craft school. It is much better to make something in the sand and represent thoughts and ideas on paper rather than colouring a picture of a sand castle. I have also been working diligently at these steps, as well as documenting students work by taking pictures and writing down what they have to day aout their creations. It's also very Reggio inspired to represent thoughts on paper by drawing what the student planned from the beginning or what they ended up with in the end. I also love how you said you guys are writing in a more impromptu way throughout the day rather than having a set time for writing. I know it means that not every single student in the classroom will have 13 writing entries when it comes time for interviews, but it's so much better to have powerful and authentic pieces of writing for each student that demonstrate their skills and where they're at, rather than 13 set writing entries on a set subject. I am totally on board with you about defending these kinds of activities that are so important in kindergarten! Keep on truckin! I am so not a crafty person, let alone teacher. I always tell parents at the beginning of the year that they won't be bringing home cutesy crafts, but they will be brining home art! 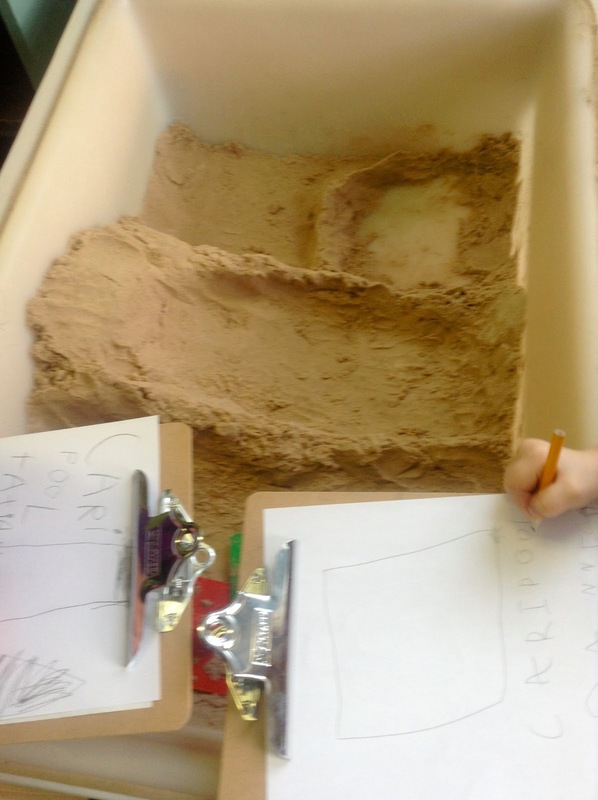 You are right, I am inspired by Reggio, to me it just makes sense. It goes into everything I believe about education. I needed to trust my instincts and beliefs about learning and since I did, I am seeing my students grow because of it. Thanks!